I started the Sunday Supper series last year for two reasons. I was burned out (no pun intended!) with cooking meals for my family. I want to reinvigorate my joy of cooking and put some new energy into our family menus. It worked at first, but then it became stressful. I was trying new recipes my family didn't like just in an effort to find recipes I could use in my posts. Eventually, the Sunday Supper posts dwindled and, by the end of 2014 they had become very few and far between. One of my blogging resolutions for this year was to get back to regularly posting Sunday Supper posts but just once a month. Well, to be honest, this first one snuck up on me!! My kids didn't go back to school until January 6th and this past week was spent just trying to get settled back into a regular routine with my hubby out of town for business a few days as well. Alas, I have no new recipe to share with you. However, I decided that, nobody can try new recipes every night. Sometimes, you just have to go with what you know and what works. So, I decided to share with you my five go-to weeknight meals. These are the ones that are on the menu about every week; the ones I know my family will eat; the tried and true family dinners that are almost always in my pantry. Pasta - Everyone loves pasta, right? Plus, it is so easy and so customizable. You can start some homemade sauce in the crock pot in the morning or you can just open a jar in the evening rush. I usually go somewhere in the middle, making my own sauce, but with canned tomato sauce and a pre-packaged spice mix. You can do different kinds of sauces (tomato, alfredo, marinara, etc.) and different kinds of pasta (spaghetti, tortellini, ravioli, shells, etc.) Add a simple salad and dinner is done! Tacos - We have tacos at least once every other week. You can use ground beef, chicken, or ground turkey. Even my vegetarian can eat them with black beans as her main protein. I just put everything out to create a "taco bar" and everyone can customize their meal to make it just they way they like it. Chicken - When I first got married, my husband told me he was going to start growing feathers if I didn't learn to cook something other than chicken! I did, but chicken is still my protein of choice. It cooks a lot more quickly than beef and you can make it so many ways. You can top it with BBQ or bread it. You can bake it or sauté it. It is so versatile. Baked Potatoes - I do this mostly when David is out of town because he thinks a meal requires meat, but the girls and I love to just do baked potatoes and salad for supper. You can bake the potatoes in the crock pot or in the oven. Much like the tacos, I just put out toppings so everyone can create their own. Add some salad or fruit and you have a filling, healthy meal. Breakfast - This is one I do when David is out of town for work because he is not a fan. (Weird, right?) However, the girls and I love to have pancakes for supper,but you could also do an omelet bar (similar to the taco or potato bar). Breakfast is usually easy and pretty quick, plus it is a good, complete meal. Another tip is to keep your freezer stocked. We have a full freezer in our basement and it was one of the best investments. I try to keep some "convenience foods" in there for the nights when I am really out of ideas or just to tired to try. I usually have a frozen lasagna, some frozen chicken cordon bleu that we like, and/or some meatballs in the freezer. There may be other things in there as well (tortellini, ground beef, etc.) We actually use a service that, for a fee of course, allows us to stock our freezer for months at a time. It is so nice to be able to just go downstairs and pull something out in a pinch. Those are my tip! Do you have any? 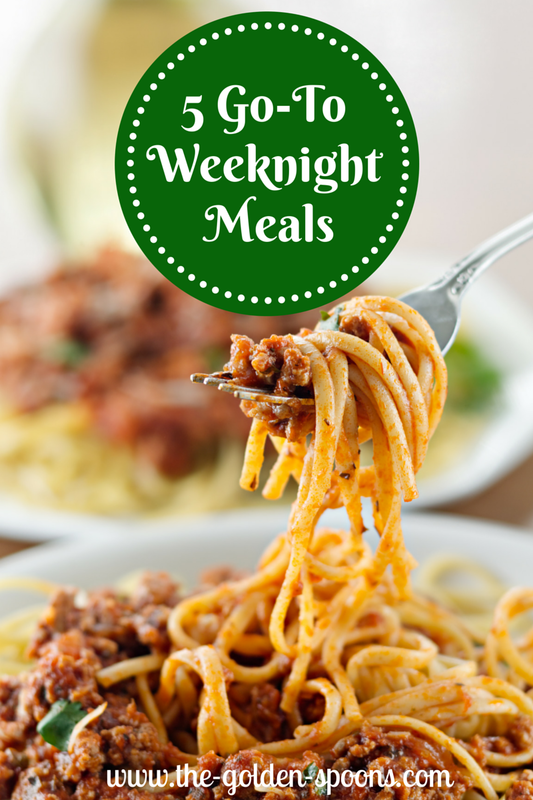 What are your go-to family, weeknight meals? I love breakfast for dinner! And my dad thinks every meal needs meat, but my dad also thinks every meal needs meat AND potatoes. All of this is making me hungry. We're not a big pasta family and I don't know why. We're not gluten-free but Cassidy makes gluten-free pasta because he likes the taste! Who knew? Earlier today I was wishing I had potatoes in the house because baked potato sounds really good- since I didn't go to the grocery store this weekend I guess I will have to make do with something else! We do a lot of the same meals - especially when Steve's gone.. breakfast for sure and then the things he doesn't like for breakfast like biscuits and gravy, etc. Ha! My MIL is gluten free, so I've eaten the pasta before and I don't mind it. My hubs expects a good ol' southern meat & three dinner. I have them on the menu for this week! As I was writing this, I realized that I do most of these when David is gone, too. They are easy and something the girls actually all like! My girls love pasta, so that is a meal I cook often. We love taco night, too! I haven't made baked potatoes for a while and I should. My husband is like yours, though, he needs to have meat with his meal. Maybe I'll just throw some bacon on top! I love these ideas Lisa. I need more EASY meals to fix for the crew here... I'm sick of my own recipes. Frozen pizza anyone? lol I LOVE the idea of baking potatoes in a crock pot. SO much easier! Pasta is favourite with us, because it's so versatile!